“Unfortunately, we have to state that trade and economic ties between our countries do not reach the political level, and the level of investments is insufficient,” Iran's Parliament Speaker Ali Larijani said at a meeting with his Russian counterpart, State Duma Speaker Sergey Naryshkin, noting “sincere and friendly” inter-parliamentary ties between the two countries. Naryshkin stressed that Russia and Iran shared similar views on most regional and global issues. “We highly appreciate Iran’s role and policy as the most important factor of regional security, and we hope to strengthen our joint positions, especially as we have similar or concurring opinions on most regional and global issues of the international agenda,” Naryshkin said, adding that he considered his trip to Tehran as “another opportunity to deepen political dialogue between our countries and our parliaments”. 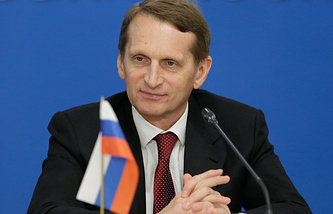 “We regard Iran as a promising reliable partner,” Naryshkin said in an interview with a TASS correspondent. “And from the standpoint of ensuring regional security, Iran plays a very significant role, being at the same time an important factor of this security,” he said, noting the need to expand cooperation with Iran to counter such challenges as illicit drug trafficking, terrorism and international crime. The Russian politician said the two countries had great potential for economic cooperation, particularly in energy, including nuclear energy, gas production and transport programs to create the North-South Corridor. Development of trade and economic relations between Russia and Iran, and implementation of several major bilateral programmes should give impetus to economic development in the Middle East and Central Asia in general, Naryshkin said. Asked about Iran’s possible membership in the Collective Security Treaty Organization (CSTO), a security bloc made up of former Soviet republics, Naryshkin said, “This proposal — to participate in the work of CSTO institutions — has been made. But the final decision rests with our Iranian counterparts."